Lets face it, put your hand up if you have popped a spot intentionally or not sometime in your life. It can be such a relief especially if you don’t experience them regularly. However you may not know that popping, squeezing and picking your spots can be dangerous for your skin. So should you pop pimples? I am going to talk about why you should or shouldn’t pop your spots, pimples, zits and how to pop spots properly without causing more pimples to rear their ugly heads. Firstly, I must point out that I strongly recommend you do not squeeze, pick and pop your spots (Correct term is Pimples) or even touch the inflamed area with bare fingertips or nails. The secrets to inflamed pimples is that if you squeeze an inflamed angry area of skin you will make it more angry even if the pimple pops and excretes its insides. This being said is why dermatologists, skin specialists and doctors recommend you to “leave them alone”. But I know the urge to squeeze spots especially if they are uncomfortable, sore and visible to the naked eye. Picking is a big NO, NO because this is just ‘taunting’ the pimples to come out and therefore causes redness, scars and inflammation. Why can’t I use my fingertips you may be asking? Fingertips may be one of the best ways to get rid of a spot however they potentially make things worse when it comes to bacteria, dirt and oils. The fingertips touch hundreds if not thousands of items, animals and tools in a day such as phones, keys, car steering wheels the list goes on. This is why you need to wash your hands regularly. Bacteria can be the main courses of spots sometimes and your fingertips generally are smothered in bacteria. Touching spots/pimples with the added dirt and bacteria can cause more infections on the skin leading to more pimples. These will generally pop themselves or heal and go back to normal if you leave them alone. Unfortunately spots can cause scars, this is why you should avoid squeezing, picking and touching spots but sometimes you really need them gone and quick for a special day or event. Here are methods that are helping others to deal with a spot in desperate times. 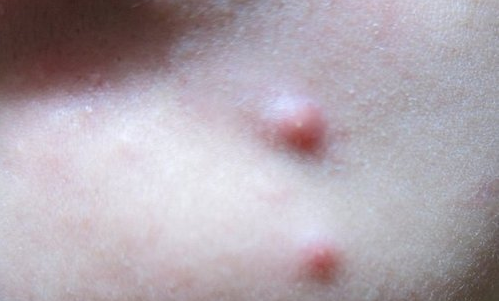 Do you Recognise The Early Warning Signs of Pimples, Spots and Zits? Oily Skin: Oil and bacteria generally is the main causes of pimples, so if you notice your skin is overly shiny or damp looking at times consider washing your face with a cleanser to remove excess oil. Lumps under the skin that are not inflamed are called blemishes and these are the first signs of pimples and once inflamed cause pimples to form. Earlier I spoke about not touching areas like these because it causes the area to become inflamed and cause a spot or pimples. if you notice lifted redness on your skin this is an early sign. Avoid touching, squeezing, picking or scratching. The best Things to do is wash your hands thoroughly, use an anti bacterial hand wash and then apply a cream to the area like the one pictured to the right. This will reduce the swelling, remove excess oil and help prevent the pimples returning. This is far more beneficial for your skin as it reduce the chances of scaring greatly and prevent more inflammation to the area. So we have learn’t that you are not supposed to pop spots and we have learn’t how to pop spots properally when you cannot resist the urge. Pimples and spots can be very annoying an embarrassing especially when they arise on the face, neck and back because they are visible to the public. If you are noticing more and more spots, pimples, blackheads, whiteheads and zits appearing recently on these areas click here to find more and help prevent more outbreaks. Acne Spot Cream Review. This is one of the best alternatives to popping pimples. Very good way to reduce inflammation, pimples size and clear acne pimples, spots and zits very quick!